Currently working on the upper reaches of the river is the dredger CHERRY SAND, a vessel built in 1968 at Appledore Shipbuilders for the British Transport Docks Board, and later transferred to Associated British Ports before they were reformed as UK Dredging. 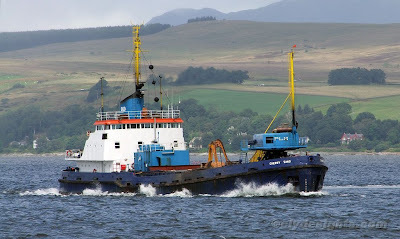 CHERRY SAND is a grab hopper dredger and has previously been noted working at Ayr and Troon over the years as well as at other British ports. She is 62.5 metres in length, and has a hopper capacity for 765 cubic metres of spoil. She has been working at the Lobnitz Basin at Renfrew.